Punti Necessari: 14700 Please note that, for now, you cannot download content from our platform directly onto a mobile device (phone, iPod, iPad, tablets...). You need to download your items onto a PC or Mac, and then transfer them onto your device in the normal way. We are working on allowing direct downloads to mobile devices but this is not possible in the current version of the platform. Sorry about the inconvenience! NOTICE: Activation key must be used on a valid Steam account. Requires internet connection. 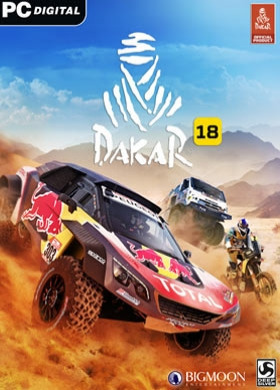 About the gameDAKAR 18 is a realistic simulation of the world famous annual rally raid organized by Amaury Sport Organisation (A.S.O.) in South America, and features stunning visuals and a variety of vehicles, including motorcycles, cars, trucks, quads and SxS. Players will compete in fierce onlin… e multiplayer races, as well as playing offline to harness and grow racing skills. Key Features Realistic Navigation System to manoeuvre through the massive open world Realistic Simulation Systems for weather, different terrain and water. Realistic Vehicle Physics System Full control of your pilots to Explore, Rescue & Repair Play with official vehicles and pilots over 5 categories (Cars, Bikes, Quads, Trucks and SxS) System Requirements Windows - Minimum OS: Windows 7 SP1, Windows 8.1, Windows 10 (64-bit versions only) Processor: Intel Core i5-2400s @ 2.5 GHz or AMD FX-6100 @ 3.3 GHz or equivalent Core i3-7340 Memory: 4 GB RAM Graphics: NVIDIA GeForce GTX 660 or AMD HD 7870 (2GB VRAM with Shader Model 5.0 or better) Windows - Recommended OS: Windows 10 (64-bit) Processor: Intel Core i5-4690k @ 3.5 GHz or AMD Ryzen 5 1600 @ 3.2 GHz or equivalent Memory: 8 GB RAM Graphics: NVIDIA GeForce GTX 1060 (6GB) or better Copyright © 2017 Bigmoon Entertainment Europe. All rights reserved. 2017 published by Deep Silver, a division of Koch Media GmbH, Austria. Deep Silver and its respective logos are trademarks of Koch Media GmbH. Developed by Bigmoon Entertainment, under license of Amaury Sport Organisation. All manufacturers, accessory suppliers, names, tracks, sponsors, brands and associated imagery featured in this game are trademarks and/or copyrighted materials of their respective owners. Unreal, Unreal Engine, the circle-U logo and the Powered by Unreal Engine logo are trade-marks or registered trademarks of Epic Games, Inc. in the United States and elsewhere. FMOD Studio, copyright © Firelight Technologies Pty, Ltd. Portions of this software use SpeedTree® technology. SpeedTree® is a registered trademark of Interactive Data Visualization, Inc. All rights reserved. Dakar™ logo is a trademark of Amaury Sport Organisation. Bigmoon®, Bigmoon logo and ForceFlow™ are trademarks of Bigmoon Entertainment. Virtual Physics System™ and U-designer™ are trademarks of Microbots Technologies.